Cottage cheese may have a snack reputation that smacks of 1950s sensibilities, but it’s a brave new foodie world and everyone’s favorite curd is making a comeback. We whipped up five recipes that would make Betty Crocker jealous. Give them a go! The only thing you have to lose is your cottage cheese conceptions. Have more creative ways to incorporate this staple? Leave them in the comments below. Prep time 10 minutes. Cook time about 20 minutes (about 5 minutes per pancake). Total time 30 minutes. Makes 6 thick pancakes, serves 3 very hungry breakfast eaters, or 6 people. In a large bowl, whisk egg with the bananas, cottage cheese, honey, and milk. Slowly add the flour, baking powder, cinnamon, and salt, stirring after each addition. Heat a pad of butter in a griddle or frying pan over medium heat. Scoop approximately ½ cup of the batter onto the griddle. Brown on both sides and serve hot. 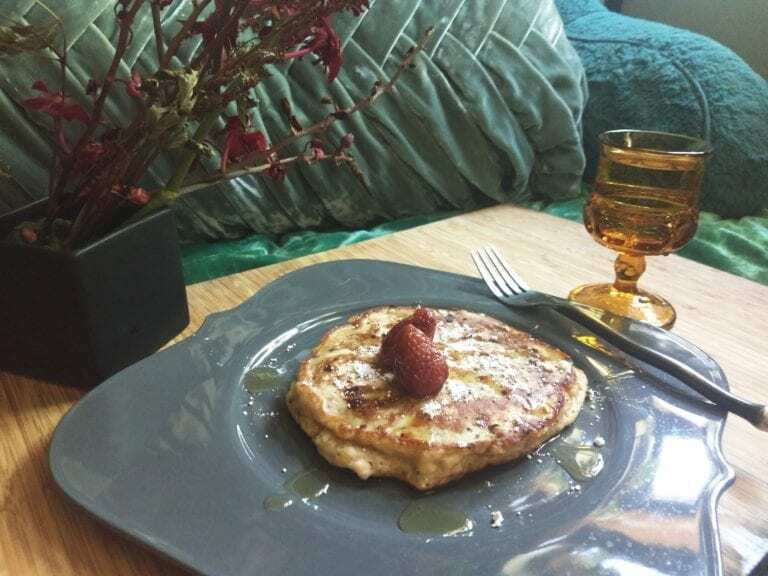 Serve with fresh fruit, sprinkle of confectioners sugar, maple syrup or honey, and butter. *Optional deliciousness: Use blueberry cottage cheese for a different flavor, or add fresh fruit to the batter. Prep time 20 minutes. Cook time 40 minutes. Total time 1 hour. Makes one 9-inch pie. 1 medium red onion, chopped and pan-cooked until almost translucent. In a large mixing bowl, stir together the flour, salt, and sugar until combined. Add the butter and shortening and cut together using a pastry cutter (or using your hands) until the mixture forms small pea-sized crumbs coated in flour mix. Pour vodka and water over the ingredients, use a rubber spatula (or your hands) to gently press the dough together, continue until the dough forms a large somewhat-sticky ball, adding more ice-water as necessary. (Do not overwork the dough, it’s better to have the dough just come together than be overworked and tough.). Press into a disk a wrap in plastic, refrigerate for at least half an hour, and up to 2 days before rolling out. Preheat oven to 350 degrees fahrenheit. Roll out crust on a cutting board or counter and drape into a pie tin, crimp the edges. For the filling: In a large bowl or mixer, whisk the eggs, flour, cottage cheese, lemon zest and juice, heavy cream, pepper, and tahini until combined well. Fold the spinach, red onion, and tomatoes into the mix with a spatula. Bake until a toothpick inserted into the center comes out without batter, about 30 to 40 minutes depending on the oven. Let cool slightly before serving, it will be easier to cut if you give it a solid 15-20 minutes to set. 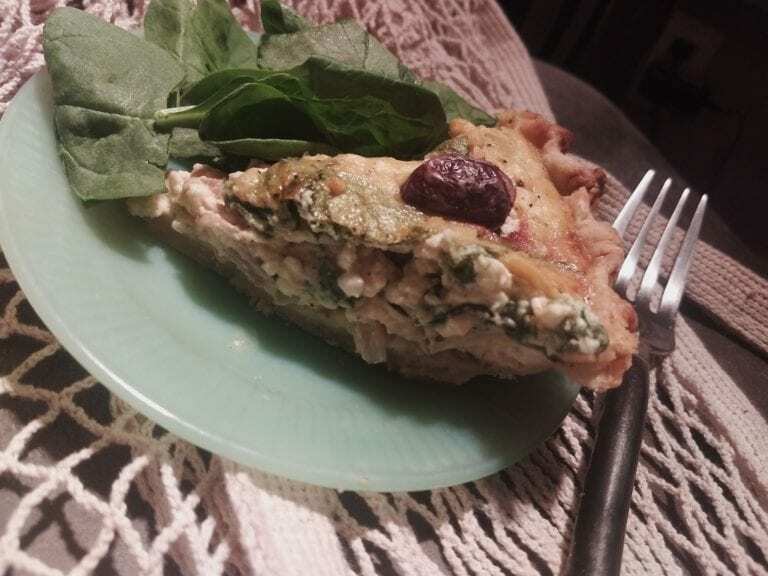 *Optional deliciousness: Add 1/2 cup crumbled feta to the top before baking. Prep time 10 minutes. Cook time 30 minutes. Total time 40 minutes. Makes one 9-inch pie. Prep: Grease a pie tin with butter and preheat oven to 400 degrees fahrenheit. In a large bowl or mixer, whisk the eggs with the sweetener until foamy, add almond flour, baking powder, milk, cottage cheese, and salt. Beat until combined and cottage cheese is smooth. Pour batter into the pie tin. 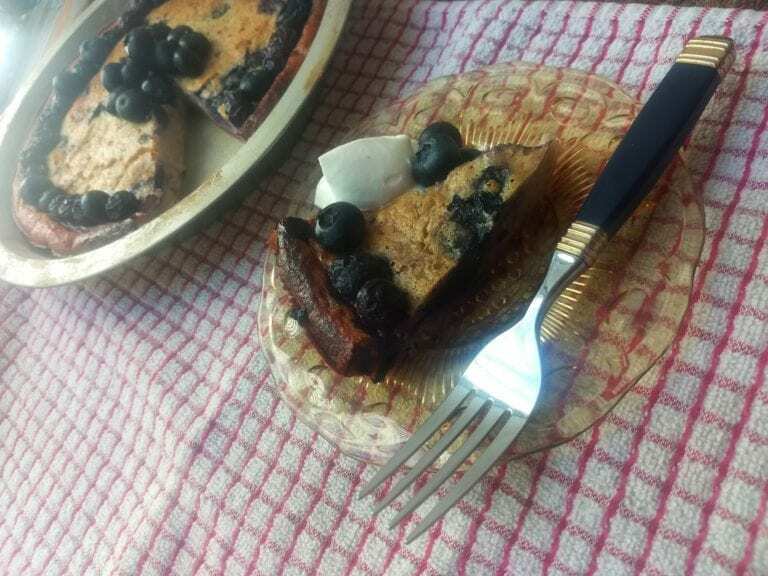 About 20 minutes into baking, remove the pie from the oven and quickly place blueberries on the top of the cake, place back in the oven quickly. Bake until a toothpick inserted into the center comes out without batter, about 30 to 40 minutes depending on the oven. Serve with fresh homemade whipped cream or ice cream for a treat, garnish with fresh blueberries. Pro-Tip: You know all those summer salads that include mayonnaise? Consider replacing the mayonnaise in ANY of them with cottage cheese. 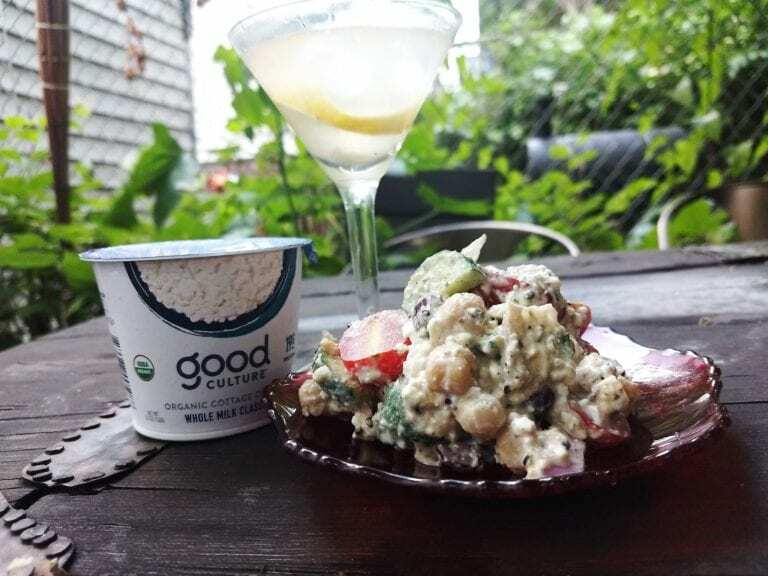 From egg salad, to pasta salad, to the below: Chickpea Tahini Summer Salad, these are all great for sharing and bringing to potlucks and are quick enough to throw together for impromptu summer gatherings. Prep time 20 minutes. Serves 6. Combine the prepared chickpeas, tomatoes, onion, cucumbers, and olives in a salad bowl large enough to mix the ingredients together. Combine the tahini and water in a medium size bowl, stir well until a little frothy. Add the cottage cheese and olive oil to the tahini mixture, mixing thoroughly. Mix in all of the remaining ingredients, including the toasted sesame seeds. Using a spatula, add the spice mixture to the salad bowl, mixing thoroughly to coat the ingredients entirely. Serve with spinach and greens or as a side dish for a potluck. 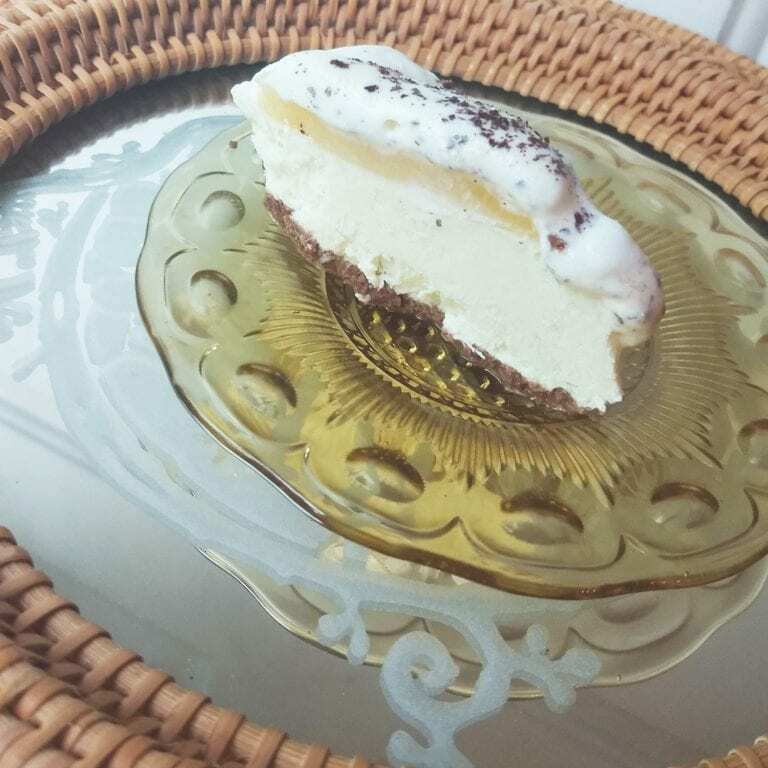 A simple treat that is maybe the easiest cheesecake or icebox pie that you’ll ever make. It will keep in the freezer, so feel free to make well in advance of a gathering. Prep time 10 minutes. Chill time at least 30 minutes. Total time 40 minutes. Makes one 9-inch pie. Preheat oven to 350 fahrenheit. In the pie tin, mix together graham cracker crumbs and sugar. Pour melted butter over the crumbs and mix with a rubber spatula (or your hands, if the butter has cooled enough). The graham mixture will look slightly darker and clump together easier when pressed. Using your fingers, press the mixture up along the side of the pie tin until you have a 1/4-inch thick shell around, then flatten out the bottom of the shell, making sure both the top and bottom of the shell are joined. Bake until the shell is slightly browned, 5 to 7 minutes. No longer than 10 minutes. Remove it from the oven and let it cool before filling. In a food processor or blender (I used an immersion blender), blend the cottage cheese, coconut milk, honey, maple syrup and vanilla together until it is super-smooth. Pour everything into the crust. And pop into the freezer. After a minimum of 30 minutes, or until the cheesecake base has begun to set, bring out and top with whipped topping of your choice and pineapple. * Return to freezer to set again, or return to fridge if planning on eating soon. Serve with pineapple simple syrup drizzled on top, chopped dark chocolate, and extra fresh fruit or whipped topping. The cheesecake is best chilled, or at refrigerator temperature, for a particularly frosty treat on a hot day, serve frozen—it will be more like ice cream. *Optional deliciousness: add a layer of chocolate syrup before returning to the freezer. All recipes by Jaclyn Atkinson. For more information about Jaclyn, click here. good culture delivers high protein, organic and non-GMO ingredients, grass-fed milk from respected cows that roam free on sustainable family farms, live and active cultures (our tummies thank us daily), no additives (stabilizers, thickeners, artificial preservatives, gross) and unique sweet and savory varieties that taste amazing. We made cottage cheese, but better.